Get Super Mario 3D Land For Free! It took about five minutes for Super Mario 3D World to make me forget all about the next generation. Within that five minutes I had worn a cat suit and heard the, quite frankly, beyond-cute meow noise made when you attack. I had climbed a wall, chased a bunny for a star, and generally had a smile so wide on my face that I was almost in pain. To those who like to jump to the bottom of a review for the score, I’ll save you the bother and say that not only is Super Mario 3D World the best game released on Wii U yet, it’s a reason to go and buy one. I’ll also let you know now that if saccharin cuteness makes you feel ill, then maybe click away right now, because 3D World is loaded, fit to burst with all the things about video games that make them so great. Unimpeded creativity drips from every moment, forcing an awed expression from the most cynical of mouths. Decades old ideas are renewed with such ease and simplicity that it’s almost unnerving. I’ve fought Bowser more times than I can even remember, yet the first encounter somehow feels fresh. 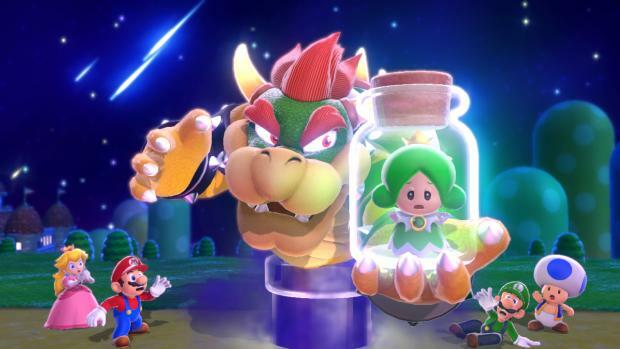 There’s always a princess, there’s always another castle, Bowser is still involved (this time he’s stolen Sprixies and locked them in jars) – it’s the design and execution of it all that makes it so special. The cat suit is new, sure, and it’s a lot of fun to play in. But it also gives the development team a chance to make the old seem new. There were always vertical levels in 3D Mario games, and bouncing between walls and using a variety of ways to get higher were always present. Now, with the cat suit, you can scramble up a wall to access hidden areas. In general, the level design owes much to 3D World’s forbearer, the phenomenal Super Mario 3D Land on Nintendo 3DS. Despite the lack of a 3D slider, you can move the camera with the right stick to reveal areas previously hidden. You don’t have full 3D control of the camera at all times, just enough to manoeuvre to a position that might give a glimpse to that hidden area. It would have been so simple to just recreate 3D Land for Wii U, and there are parts that feels like that. But there’s just so much icing on the cake it’s hard to know where to begin. You can navigate the world map with freedom – Mario can sprint and jump, even collect a few coins on the world map – and there are entirely new, optional levels specifically for Toad. Akin to a mini version of Mario Vs. Donkey Kong, Toad has to move around a single smaller level that is fully visible from the start. He can’t jump, and you’ll have to move the camera around to find hidden stars; if you find them all, you get to keep them. There are obstacles, hidden tunnels and all sorts to make this an interesting addition, and a nice distraction from the regular gameplay. Each main level has 3 hidden green stars which are a currency of sorts. Certain levels (like Bowser castle ones) will require a set number of stars to open up, but there is also a hidden stamp within each level to collect which are usable on Miiverse. Bosses are exciting encounters, with the first one involving Mario (or whichever of the four playable characters you’ve chosen) chasing Bowser, who is driving a car and throwing bombs at you. Kick the bombs back and it’ll damage him, before eventually you beat him and move on to the next level – and that’s just the first boss level, for goodness’ sake. 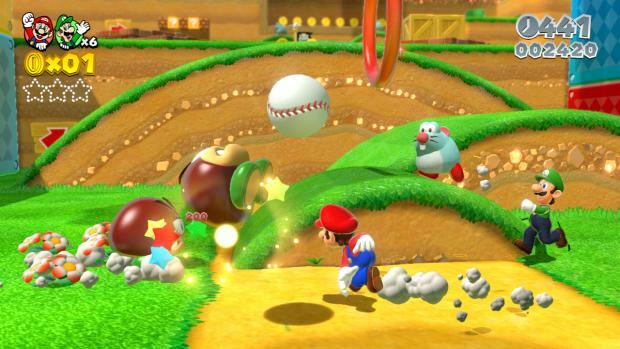 Another new power-up (the cherry) doubles the fun, meaning if you were playing as Mario, now there’re two Marios. You control them in exactly the same way as you’d control one, but it adds yet more variety to levels. For example, there will be a platform with a “2” on it – guess what you need in order to activate the secret hidden within? Most of the time it will just be one of the green stars, but like previous games, part of the fun is perfecting the level. 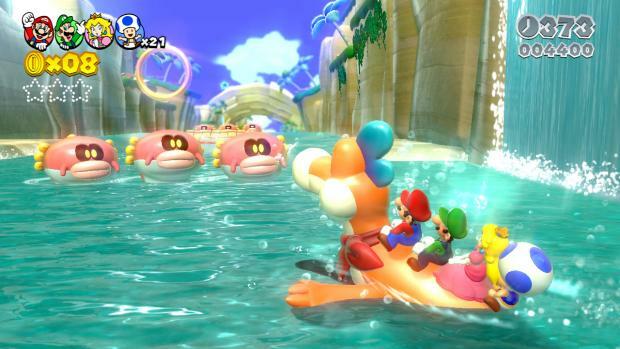 Then there’s Plessie, who you can ride through water levels. You can go inside Koopa Trooper shells once you’ve knocked them out, you can get an auto-firing cannon on your head, the tanooki suit returns from 3D Land, not forgetting the transparent pipes which allow for even more exploration and hidden surprises – there’s just so much to play around with as you rinse each level dry, and all of it is blissfully enjoyable. Speaking of the levels, as we’ve come to expect these days, the design is exquisite, borderline perfect at times. Even in multiplayer (up to four players, local-only) they don’t break or frustrate. Adding players means that you’re sharing lives and screen time, and if a player strays too far into the level, slower players will quickly pop into a bubble and catch up. The second-long pause when you take a hit from an enemy returns from previous multiplayer Super Mario titles, but the 3D nature of the levels themselves mean that you’re rarely sharing exactly the same plane of existence, so frustration is minimised. Levels also change depending on the number of players present, and the aforementioned block with a “2” on it will change to a “4” in 2-player mode, and so on. 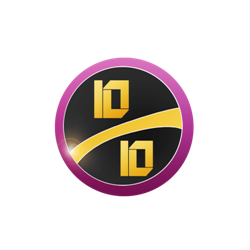 At the end of a level, players will be rated based on their contribution to the overall score, the winner will wear a crown for the next level, as if to remind the other players: “I’m the best. Come at me, bro”. The Wii U’s Gamepad isn’t relegated to being just a controller, either, as it can reveal hidden blocks and secrets via touch. There are also sections that require you to blow into the Gamepad mic, cribbed from games like NintendoLand. Blowing not only moves platforms, but can also reveal secrets here and there. On top of that there are static platforms sections that you need to touch to bring them out of the background to allow progress and, of course, the entire game is playable with just the GamePad. You may have noticed at this point, I’ve barely touched upon how it looks or sounds, which is because Mario feels so right in HD that it’s something you almost forget upon playing. There are some truly special moments that are made by the visuals, just as there were in 3D Land, such as underground sections that use excellent shadow work to reveal the collectible stars and hidden enemies. But it’s the attention to detail that really shines through. Even on the world map, Mario will look over his shoulder, have small reactions. He’ll look scared in a ghost house, and combined with the moment to moment play, there’s not a single level that didn’t make me exclaim “Oh my God!” on first playthrough, so incredulous was I at the confident execution of just about everything on show. Audio is top-notch, with some callbacks to older games (the Super Mario Bros. 3 Toad house music) and, honestly, 3D World really does look exceptionally pretty – whether it’s the first set of levels in grassy areas, or the icy third world. In fact, if there’s a complaint to be aimed at 3D World, it’s that the levels follow the tried and tested method: grassy, desert, ice-world, and so on. It’s a minor grievance, really, as there are so many new ideas elsewhere. 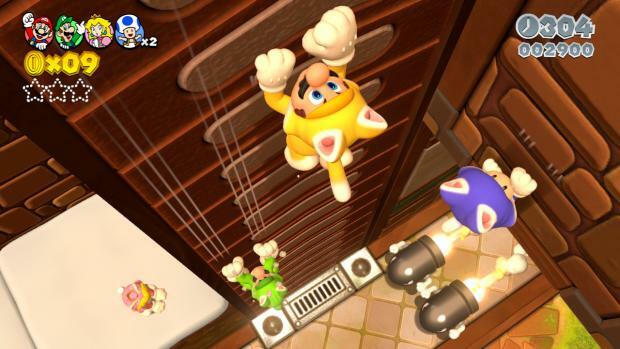 VERDICT: Super Mario 3D World is a triumph from start to finish. Beautiful, colourful, amusing, and bereft of any cynicism whatsoever. A utter breath of fresh air that plays like a dream; this is almost certainly the game Nintendo should have launched the Wii U with. However, here we are, finally getting the incredible Mario title we deserve.